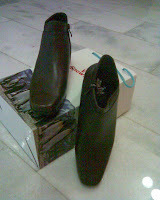 KC bought me this pair of boots to wear to England. I wanted a cheaper pair but he insisted on this. Knowing me..I will not wear it after the 11day trip. What a waste. Even now, I have not worn it...not in this hot weather!!! Should I wear it to church or school? I will be totally uncomfy and out of place! Oh dear...how am I going to break into this new pair of shoes? But I have learnt not to complain when given gifts...then more will follow! 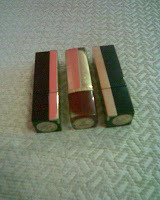 Take for example these lipsticks....he bought them when he made trips overseas. The colours are just not suitable for me...I have to mix them with other colours but when I received them; I felt so honoured that he would dare to buy cosmetics for me. So again...no complaints! 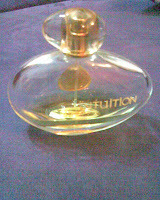 This is Intuition by Estee Lauder. I did request for a perfume. He knows EL is my favourite brand, he trusted the salesgirl's choice and bought the largest bottle!!! I can't finish using it and it is losing its scent. But again...no complaints!! Not many gifts....but I treasure every thought and effort into each that comes my way. It was like centuries ago....How are you? M jumping up and down here. Din know it's you. Thousand apologies. You in London? I will be in Manchester, then go up to Lake District (2days) and then London (4 days). Nd advice, want to do day trip to stratford, oxford, wickshire? and ??? oh dear; memory failing. Tot of taking a tour package. Can I manage it with public transport or just take tour n less hassle?